Well known for the superb colors of its foliage in autumn. The bark is a dappled pale brown and exfoliates with age revealing a grey orange and brown color. The small leaves (which resist scorching during drought) have 3 short lobes close together - hence the name "Tri-Dent". Circumference of the trunk measures 23". Diameter of the trunk measures 9.0". When spring comes around the new growth is often bronze to purple. 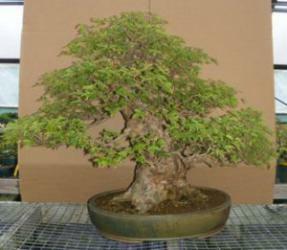 Desirable for bonsai because of its small leaves. Deciduous. Keep outdoors. 113 years old, measures 41" x 37" x 34" tall. Potted in a 23" ceramic earth toned circle container. Circumference of trunk measures 23". Diameter of trunk measures 9.0".